Welcome to the first in our series of interviews with executives who are already taking the next step beyond thought leadership and are leading the conversation in their industries. 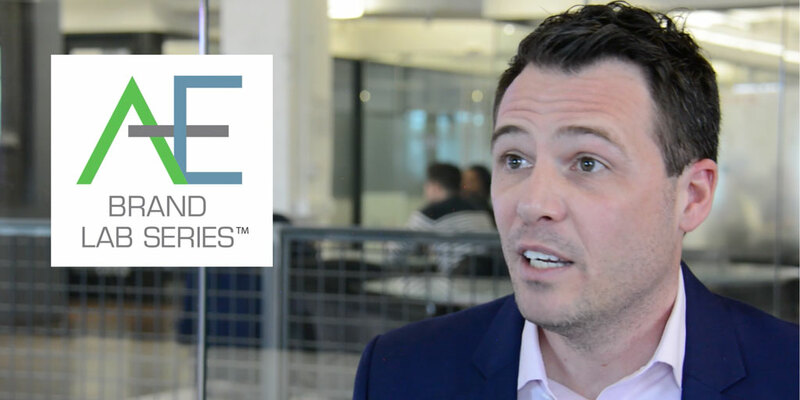 In this inaugural edition, our Chief Conversation Officer, Chuck Kent, talks to Brian Walker, CEO of AE Marketing Group, about why and how he created the AE Brand Lab Series podcast. It’s a great example of how conversation leadership can take you beyond building awareness to creating the kind of relationships that build new business. Chuck Kent: Before we dive in, please gives us the elevator speech for your firm. Brian Walker: AE Marketing Group believes that together we build better brands. Every day we’re helping Fortune 2000 size companies, high-growth tech companies and non-profits think about their brands in a much larger context than as just a creative or a marketing or advertising function. This is really important, because as you think about the way the market is today, about how technology is changing, about the rise of an empowered consumer and customer, it all requires organizations of every size to think about their brand much more broadly. Do we design our products and services in the way that’s meaningful? Are we advocating, engaging and empowering our own employees? Do we provide a good customer experience? If you can get all those things right, it makes the marketing function a little easier — and that’s how we help our customers every day. CK: I know you’re also very involved as a speaker, mentor, non-profit board director and active leader in your business community. In short you’re making your presence known already —why then did you decide to invest extra time and resources in a podcast? BW: That’s a great question, because the introvert in me actually jokes a lot that I prefer to fly under the radar… But I had three big goals for this podcast. The first was to create a new revenue stream for the company. Secondly, I wanted to help build our own organization’s brand. We’ve been very focused on – and thankfully successful with – our revenue growth, because we’ve been so very focused on building out our customers’ brands. But we really needed to invest more in our own brand, to keep our growth going. Then the third and final aspect was simply that I saw a real market need. There’s a tremendous number of marketing podcasts out there today, but I think a lot of them are simply white noise. They’re often just consultants talking to themselves, or to other consultants. With the Brand Lab Series, I saw an opportunity to have conversations with C-level executives from big brands, as well as entrepreneurs. I just knew that combination would produce some great conversations of real value. CK: But why conversations? Why not just concentrate on your own thinking, on pushing your own thought leadership content, as seemingly everybody else wants to do? BW: There are a couple of things to consider. One is, I know that every time we do a Brand Labs Series podcast I’m smarter for it. I know the team that works on the podcast is smarter for it. It helps our own professional growth. We’re dealing with, and learning from, C-level executives at very large brands, we’re dealing with entrepreneurs, and they’re all in a very dynamic economy right now. They’re in very competitive industries, handling a lot of very strategic challenges and issues that are far greater than marketing. So it helps us learn as much as it helps our listeners. I saw these conversations as a real opportunity to build community. And secondly, I saw these conversations as a real opportunity, a chance to build a community where people could learn from each other. And we’ve been very lucky. We’ve had the CMO of Deloitte on the show. We’ve had one of the leaders of Internet of Things at IBM. We’ve had executives from Aon and many others. It’s been a great opportunity for everyone to learn together. CK: All those people have covered a broad range of topics, broader certainly than the co-creation and customer experience one sees referred to on your home page. Why take such a broad view of brand marketing — a view which frankly seems to stretch well beyond your wheelhouse? BW: I don’t know that I’d say that it really stretches beyond our wheel house, because when you break down our customers as individuals, they’re all C-level executives and they’re working at companies inside industries of rapid change, facing very fierce competition and trying to figure out constantly changing consumer behaviors. So one the things that we want to do via the podcast is provide a voice to speak to those concerns. We recently had Jonathan Copulsky from Deloitte on the podcast. He talked about his role as a Chief Content Officer and how the best content that Deloitte could provide is thought leadership — truly useful information that addresses the challenges and problems of their customers. And that’s exactly the same playbook we’ve created with our Brand Lab Series, so that we can have more impact with current and future customers. CK: Yes, but creating a podcast and producing it with the kind of consistency and regularity required to build an audience is no small investment of either time or money. Has it been worthwhile — is it paying off? What really what excites me is the effect on our bottom line. BW: Absolutely, the recognition that we’ve gotten from Inc. and Forbes and others has been great. But what really what excites me most is the effect that it’s had on our business, on our bottom line. In our first season we did 36 episodes of the podcast, and in just those first 36 weeks one guest went from being an interviewee to becoming a customer. In that same time frame we had another new customer join the AE Marketing Group client roster, but this time as a result of hearing the podcast. And there’s another way it’s paying off that might not be so obvious. That’s because a tremendous amount of the work we do is highly strategic and many times confidential, so we’re not able to blast out detailed case histories and such on our website. But by having this podcast, we get to talk about any number of business and brand challenges that our customers and prospects are grappling with. And we get to do it in a way that let’s not simply talk about our expertise but actually demonstrate it — so the listener can hear for themselves how we can help them. CK: So, given all that, what advice would you offer to another executive who might be considering something like this, some jump into the crowded thought leadership arena? BW: My advice to any executive would be to lead the conversation. It has been a tremendous tool for me — and I think for everyone who’s participated in the Brand Lab Series — to create and strengthen executive relationships. And now we’ve built out an ecosystem where entrepreneurs are helping big-brand, C-level executives, and C-level executives at big brands are in turn helping entrepreneurs. It’s been an invaluable journey for us.